Austrian contract manufacturer Magna Steyr took the Peugeot RCZ from concept to production in less than two years by using virtual development techniques that allowed it to forgo making a physical prototype. About 300 people at Magna Steyr's engineering center in Graz were involved in the 2+2 coupe's virtual development. Magna Steyr, which is a unit of Canada's Magna International Inc., expects to produce around 20,000 RCZs this year. The contract carmaker's president, Guenter Apfalter, told Automotive News Europe that the company used the global economic downturn to reinvent itself as a so-called "one-stop-shop" for automakers that want to quickly and cost-effectively produce niche derivatives of their volume platforms. Magna Steyr's first win in this area was the Peugeot RCZ, which shares more than half its parts with the 308 compact. Magna Steyr also makes the Aston Martin Rapide, Mercedes-Benz G class, Mini Countryman and the painted bodies-in-white for the Mercedes SLS AMG in Graz. In addition to vehicle assembly, Magna International's auto component units won work on the RCZ. 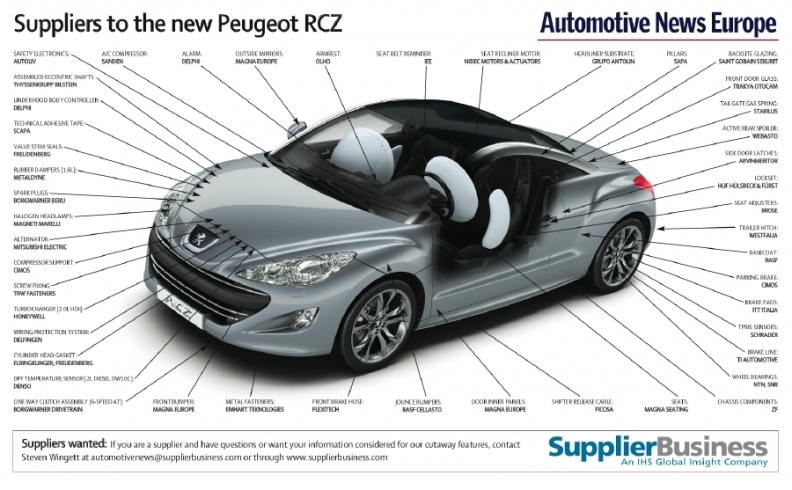 For example, Magna Cosma's contributions include the roof and doors; Magna Exteriors & Interiors provides the instrument panel; Magna Seating the seats; while Magna Electronics equips the RCZ with its pedestrian protection system. Other important suppliers include Italy's Magneti Marelli S.p.A., which is the car's telematics provider; Saint-Gobain Sekurit (a subsidiary of France's Saint-Gobain SA), which supplies the coupe's complex rear window backlite glazing; and Delphi Automotive LLP, which is responsible for the car's alarm system. Peugeot unveiled the concept car that inspired the RCZ at the 2007 Frankfurt auto show and announced the decision to proceed to full production at the Geneva auto show in March 2008. The RCZ debuted in spring 2010. Prices start at 28,400 euros (about $38,600) in France.